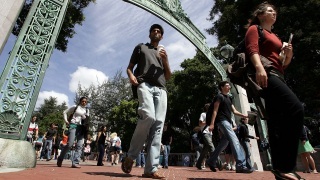 Police are warning University of California at Berkeley students, faculty and staff and Berkeley residents of 19 auto burglaries on or near campus since the beginning of last month. The burglaries since June 1 have occurred in various parking lots and in most of the burglaries the thieves broke a window to get at valuables in plain view. To prevent burglaries, police recommend locking all car doors and closing all windows, parking in well-lit and largely populated areas and trusting your instincts. Also, avoid parking next to occupied vehicles. Police recommend keeping a copy of the vehicle's registration and proof of insurance in a wallet or purse and then removing everything from the vehicle that has a family member's name or address on it. Anyone who has permission to drive the vehicle should have a copy of the registration and proof of insurance with them, according to police. Be aware of any nearby emergency phones when parking, avoid leaving a garage door opener in the vehicle and call university police if something suspicious happens. Callers can dial 911 or 642-3333 from a cellphone or use one of the campus Blue Light phones. Anyone with information about any of the burglaries is urged to call police at (510) 642-0472 from 8 a.m. to 5 p.m. and (510) 642-6760 at all other times.